Zabu was missing her companion, a lion who was put down earlier this month. TAMPA, Fla. — Big Cat Rescue in Tampa says one of its residents has died of a broken heart. 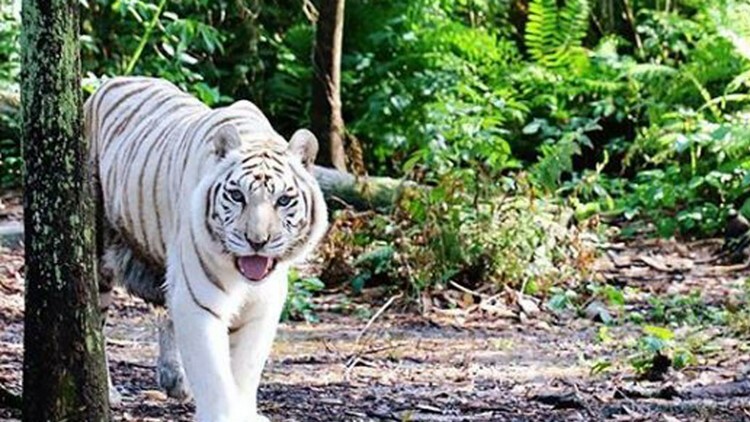 The rescue said Zabu the white tiger was euthanized Monday after suffering from kidney failure. Officials, however, said they believe she died because she was missing Cameron, a lion who was rescued with Zabu in 2004. The rescue called the cats "Big Cat Rescue's odd couple." It said the two were raised together as a roadside zoo, and its owners had hoped the two would mate so they could sell "liger" cubs. The rescue fixed the two cats and built a big enclosure for them. Cameron was put down March 12.